Another Chinese religion similarly matches the magnitude afforded to its individuals of great insight and conduct. This time, though, the source is the Tao Te Ching, the ancient text of Taoism (also spelled as “Daoism”). Unlike Confucianism, with its emphasis on social structures and education, Taoist philosophy stresses harmonious action by transcending such institutions. The Tao Te Ching, thus, speaks of the person who relinquishes contrivances and artifice to live in accord with nature. And at one point, Lao Tzu, who’s credited as the author of this book, compares such an individual to an infant whom birds of prey will not disturb (2). The approaches of Confucianism and Taoism often do not coincide, so their presentations of a wise person’s relationship to eagles, hawks, and other raptors differ subtly. Yet this divergence retains comparable features, which may offer a look into how both religions complement one another, not unlike the concepts of yin and yang. In fact, China has a rich history of balancing multiple spiritual disciplines. For instance, before the rise of communism in that country, people practiced Buddhism alongside both Confucianism and Taoism as well as various folk religions. And over time, such systems merged into a kind of socio-religious amalgam still evident in Chinese communities throughout the world (3). Outside of religion, China has widely embraced bird imagery. Among the 12 Chinese zodiac signs, one finds the rooster (4). An ancient martial arts fighting technique is named after the crane (5). Certain avian creatures are employed to indicate important social bonds, or the lack thereof. For instance, a pair of Mandarin ducks signify marriage, whereas a single wild goose implies estrangement (6). 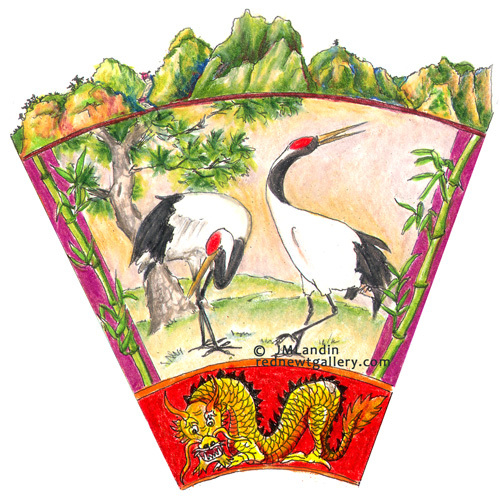 Even the Chinese Imperial Court, as scholar Patricia Bjaaland Welch explains, once relied on bird-based badges (e.g., of peacocks, egrets, paradise flycatchers, etc.) for ranking its officials (7). Moreover, she elaborates in her book Chinese Art: A Guide to Motifs and Visual Imagery on how that country’s fine arts portray arrangements of specific birds, plants, and other animals to communicate meaningful social themes (8). Overall, Chinese culture frequently imbues birds with symbolic significance and positive connotations. Jack Tresidder notes in his Symbols and Their Meanings that two common examples, the pheasant and quail, represent virtuous behavior and skill (9). Similar use occurs in Chinese religions, too, for avian creatures often exemplify spiritual wisdom. For example, the Taoist philosopher Chuang Tzu states in scholar Burton Watson’s translation, “The true sage is a quail at rest, a little fledgling at its meal, a bird in flight who leaves no trail behind.”(10) The last of these three metaphors appears also in Buddhist texts, as noted in a previous post. The pheasant and quail, though, are just a few winged creatures of importance in Chinese religions and folklore. Before looking at the most popular avian representatives, consider that even questionable birds are not entirely deemed undesirable and without value. In ancient China, as in many places of the world, the owl was considered an ominous creature, for its appearance supposedly signaled imminent disaster or, even worse, death. Thus, an owl’s entry inside the residence of Jai Yi, a Taoist politician during the Han dynasty (206 BCE – 220 CE), spurred him to serious spiritual contemplation (11). The statesman, however, discovered profound inspiration in the superstitions of his peers. on; fortune’s where disaster hides. Jai Yi is not the only one from this time period who reconsidered the owl’s supposedly portentous nature. Many of his contemporaries apparently did so as well. “During the Han dynasty,” ornithologist Edward Armstrong explains, “ornaments called ‘owl corners’ were set on the corners of roofs to protect dwellings from fire.” He explains that, due to the creature’s reputation as a “bird of darkness,” the bird and its image were thought capable of preventing lightning strikes and the subsequent incineration of buildings. (14). So, although associated with harm and ruin, even the owl was clearly believed at times to possess protective qualities. Of course, owls have never been as popular as many of their larger, diurnal counterparts. And of these, no other bird has appealed to Chinese religious sensibilities like the crane. The long-legged creature remains an iconic representation of the wise Confucian scholastic (15, 16). Meanwhile, for Taoists, the bird is commonly associated with longevity and immortality (17, 18), characteristics ascribed to living a virtuous life. One prominent Taoist was said centuries ago to have resided on White Crane Mountain (19). Today, the recently rebuilt Yellow Crane Tower stands near a site where several legendary figures supposedly took flight on a mythical golden bird (20). Moreover, depictions of Taoism’s celebrated Eight Immortals frequently include a crane (21)—though a stork appears by some figures (22). Chinese legends and art also include imaginary birds, such as the aforementioned yellow crane. While too many mythical avian creatures occur to detail here, two of the most important are the great three-legged crow of the sun and the magnificent phoenix. Both have existed as emblems of imperial Chinese rule (23, 24). The former bird became a prominent figure later in Japanese lore, as will be noted in the upcoming post on Shinto. However, Confucius attached significance to the phoenix. For him, this creature represented the wise monarch, the type of figure he wished to see eventually come to power (25). And though such a person never ascended the throne during his lifetime, Confucius left a legacy of ethical teachings to guide the future leaders and citizens of his country. Spanning thousands of years before Confucius and the first Taoists as well as after, China’s history is vast. So, of course, is its size. From the rugged Himalayas to an extensive eastern coastline, the nation encompasses great geographic diversity. An abundance of avian life, thus, can be found there. The same holds true of birds in Chinese culture. Game birds, waterfowl, songbirds, and raptors figure in several millennia of scriptures, folklore, poetry, and paintings—more than can be presented in one post! Overall, avian symbolism in Confucianism and Taoism comprises just a part, albeit an important one, in this country’s myriad cultural traditions. Renard, J. 101 Questions & Answers on Confucianism, Daoism, and Shinto. Mahwah, NJ: Paulist Press, 2002. p. 129. Lao Tzu. Tao Te Ching. Dale, R.A. (translator and commentator). London: Duncan Baird Publishers, Barnes & Noble Inc., 2005. pp. 158–159. Sun, R.Q. The Asian Animal Zodiac. Rutland, VT: Tuttle Publishing, 1974. pp. 161–176. Galante, L. Tai Chi: The Supreme Ultimate. York Beach, ME: Red Wheel / Weiser, 1981. pp. 15–16. Liu, W., Lo, I.Y. (editors). Sunflower Splendor: Three Thousand Years of Chinese Poetry. First Midland Book Edition. Bloomington and Indianapolis, IN: Indiana University Press, 1990. p. 256. Welch, P.B. Chinese Art: A Guide to Motifs and Visual Imagery. North Clarendon, VT: Tuttle Publishing, 2008. p. 67. Tresidder, J. Symbols and Their Meanings: The Illustrated Guide to More than 1,000 Symbols—Their Traditional and Contemporary Significance. New York: Metro Books, Duncan Baird Publishers, 2006. p. 69. Chuang Tzu. The Complete Works of Chuang Tzu. Watson, B. (editor, translator). New York: Columbia University Press, 1968. p. 130. Barnstone, T., Ping, C. (editors, translators). The Anchor Book of Chinese Poetry: From Ancient to Contemporary, the Full 3000-Year Tradition. New York: Anchor Books, 2005. p. 38. Barnstone, T., Ping, C. p. 39. Barnstone, T., Ping, C. p. 41. Armstrong, E.A. The Life & Lore of the Bird: In Nature, Art, Myth, and Literature. New York: Crown Publishers, 1975. p. 215. Taylor, R.L., Choy, H.Y.F. The Illustrated Encyclopedia of Confucianism: A-M. New York: Rosen Publishing, 2005. pp. 157–158. Palmer, S.J. Confucian Rituals in Korea. Berkeley, CA: Asian Humanities Press, 1984. Barnstone, T., Ping, C. p. 217. Liu, W., Lo, I.Y. p. 87. Barnstone, T., Ping, C. p. 355. Wilkinson, P. Eyewitness Companions: Religions. New York: DK Publishing, 2008. p. 254. Legge, J. (translator), Muller, F.M. (editor). The Sacred Books of China: The Texts of Confucianism. Volume III. London: Oxford University, Macmillan and Co., 1879. p. 406. Posted on August 10, 2015 April 6, 2019 by A-wing + A-way	This entry was posted in Art, Birds, Poetry, Religion and tagged China, Confucianism, Confucius, Cranes, Crows, Folklore, Owls, Symbols, Taoism, Zodiac. Bookmark the permalink. Fascinating information. Well-researched and so rich with details. I really do love that artwork at the beginning. I’ve thought to photograph some the birds that probably got my attraction to them sunk into my sub-conscious early on….cranes like in the picture above but on oriental vases and lamps collected over our generations in the military and being assigned to Asia. And some wall art too. Never thought one day I’d be trying to take pictures of the long legged species!! Your research is so wonderful and complete that I need to really sit down and spend dedicated time going through everything you have done!! Maybe beyond their beauty it is simply that they can fly that fascinates us and surely links them to the divine. Thanks so much for your kind comments about the artwork! My wife illustrates those images, so I’ll be sure to let her know. Cranes are quite beautiful. I wonder, too, if their size is part of what amazes us. Interestingly, people once thought smaller birds piggy-backed on them during migrations. And in China, Taoist sages were thought to ride them.